As the environmental manager, for a gold mining company, Lefranc manages environmental systems, policies, processes and resources and advises management on applicable regulations and best practices in the environmental field. This includes ensuring the mine has an Environmental Impact Assessment and Environmental Management Plan; implementing and managing a waste management system, and following up on environmental activities, such as training, audits, inspections and risk assessments. 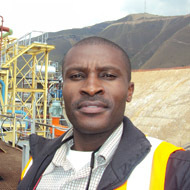 Before joining the gold mining company, Lefranc was a lecturer teaching modules such as hydrobiology and laboratory techniques. He joined the company in late 2005 as a GIS Technician responsible for map work, including scanning, geo-referencing, digitisation and attribution into GIS format. Having been part of a poor family which could not take care of my education, I had to rely on obtaining scholarships to study. My plan has always been - as much as possible - to seize all opportunities that may present themselves to help me develop my career through either a continuous development plan, or through other training activities. I am open to learning every day and interacting with people. I always have a feeling that there is a lot I do not know, that I need to know and need to be exposed to. I chose to become a member of IES because I am fond of professional, career and educational development. I am one of those who always feels like there is a lot that needs to be mastered in this world and that I may need to pass on to others so as to enjoy a better world. I believe IES is a great place to be, should I want to develop myself in terms of CPD and get a chance to be in contact and interact with learned people around the world and take advantage of the multidisciplinary development aspect of the society. He feels that his job contributes to the development of his community through environmental education, environmental monitoring and involvement in a business that works hand-in-hand with the surrounding community. Twangiza Mining SARL is the first gold mining company in the region where the local community had to be trained from scratch to take part of the project as employees. Lefranc finds the challenge of drawing up policies that affect the environment, community relations and human resources exciting.